Orchidelirium, the theme of the NYBG Orchid Show for 2016, refers to the Victorian period in England when there was a renaissance in the collection, research, propagation and cultivation of rare and exotic plants which eventually morphed into an obsessive craze for orchids. 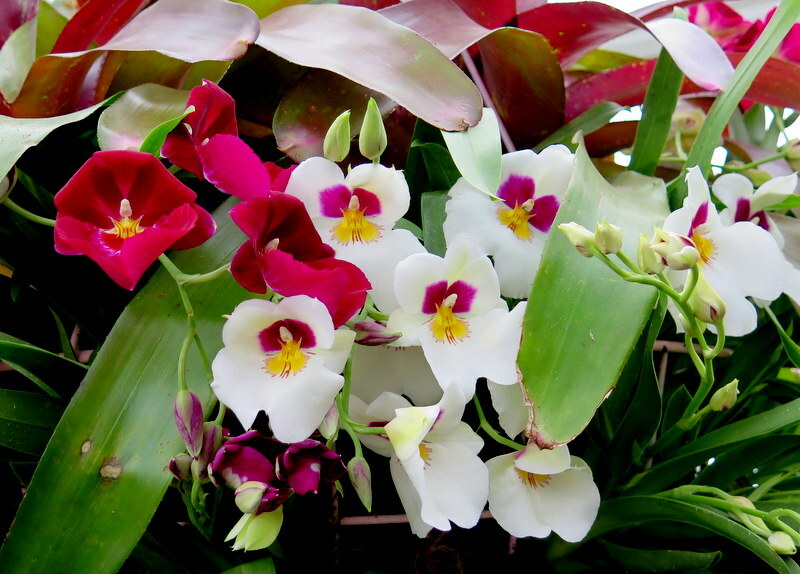 The selection of the theme dovetails with the 125th Anniversary of the Garden because the Victorians’ orchid obsession spawned many innovations in propagation and cultivation and hybridization of orchids that has continued to this day. 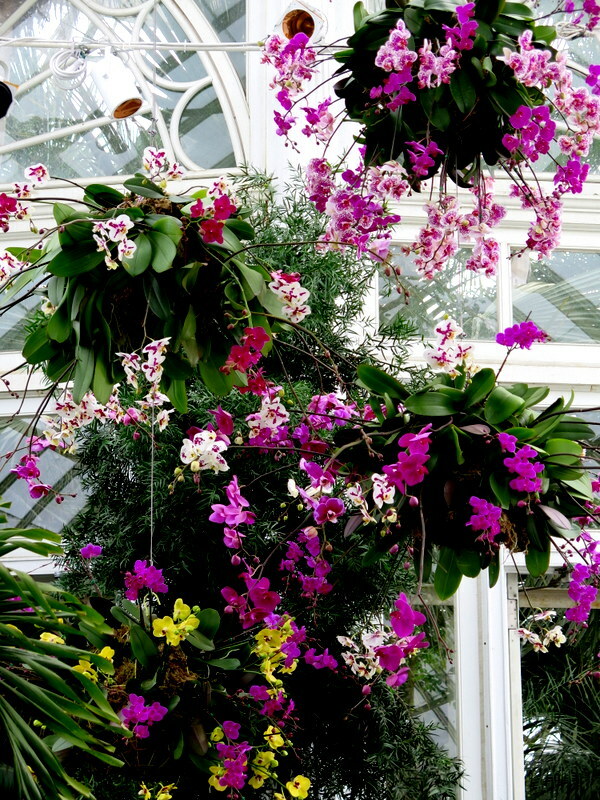 The Victorian passion for illimitable orchid gems even improved trends in greenhouse design and helped inspire the Victorian design for the Enid A. Haupt Conservatory. 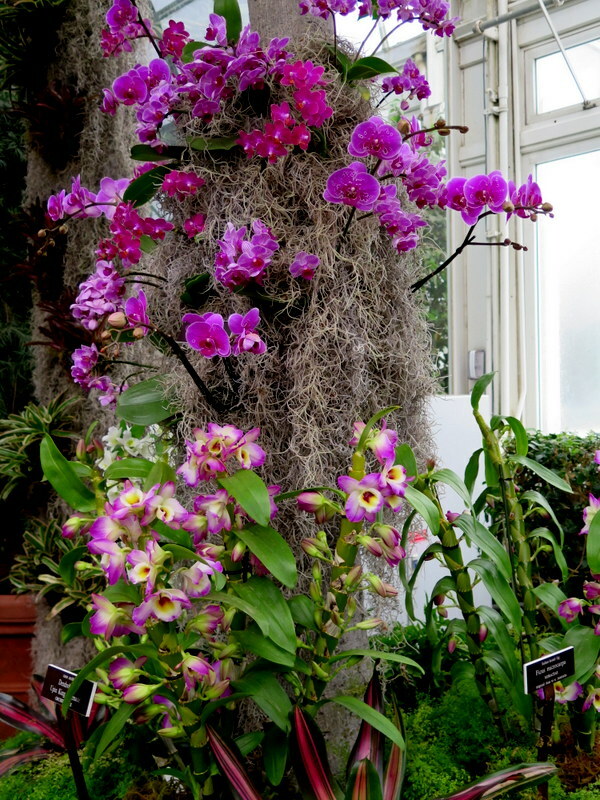 Indirectly, it is because of Victorian orchid mania that the NYBG has one of the largest institutional orchid collections in the world with over 7,000 individual specimens as a part of its entire collection, a fact which Marc Hachadourian orchid curator reinforces. The family Orchidaceae is the largest and one of the most varied of blooming plant families in the plant kingdom and as a result it has been used to conduct research and encourage efforts toward conservation and habitat preservation. 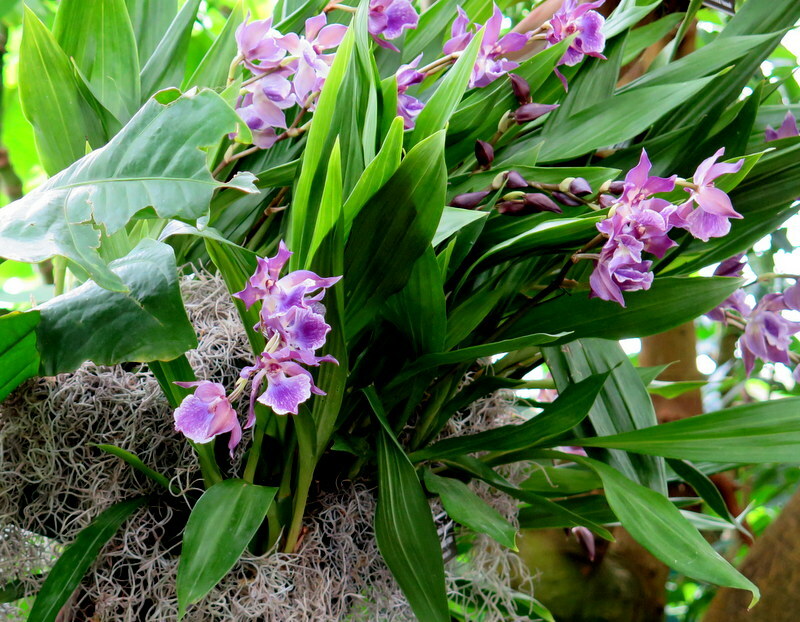 Additions from the historic, permanent orchid collection are included in the Orchidelirium exhibition. 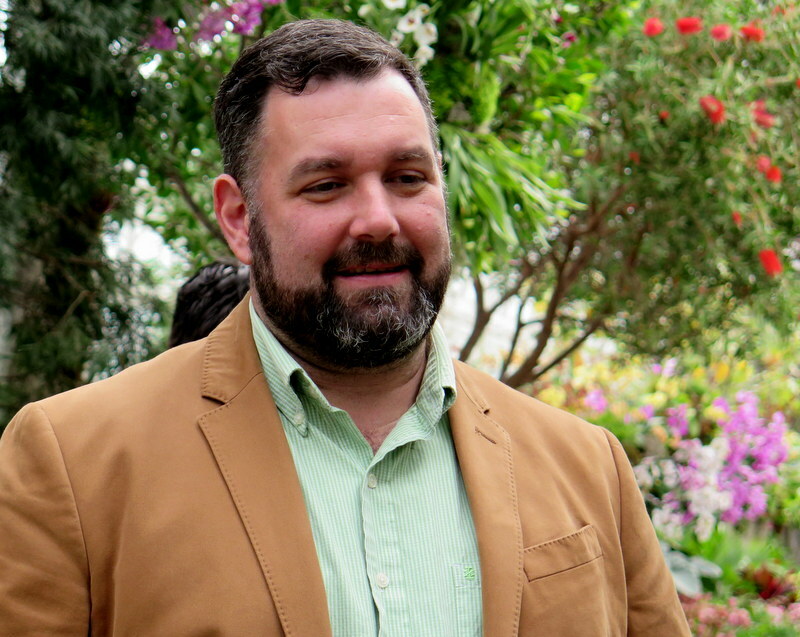 Christian Primeau, the show designer and manager of the Enid A. Haupt Conservatory oversees the extensive tropical/subtropical plant collections housed in 11 unique environments in the Conservatory. Primeau reinforced the tremendous influence the Victorians had and continue to have today. It is because of them that orchids are the most charismatic and popular of plants. As NYBG orchid curator Marc Hachadourian says, “They are the pandas of the plant world.” It is their popularity that has encouraged growers and cultivators to create over 150,000 man-made hybrids for us to enjoy. Christian Primeau talked to a group of us about his design inspiration for the show and clarified that the two week installation period was a high pressured and frenetic but absolutely enjoyable time. Orchidelirium has a whole different meaning for my staff and me because we’ve been working 13 hour days including weekends. We were pretty ambitious with the design and we hope you like it. But we’re all hallucinating at this point. I think I’m one of those rare people and I think Marc probably shares the same feeling of love for our jobs. It’s my hobby and my career. And it’s just what I’m passionate about. I hope that’s not the case, but loving one’s job seems like a rarity these days. I owe everything around me, this entire beautiful collection, this palate of plants that we get to work with, we owe all that to the people who came before us who were passionate. As Marc explained their motive may not always have been so pure, a lot of time it was a passion for personal glory or for profit, but in any case we owe what we have now, where we are today in this industry, everything around you that you see to that passion. This is a celebration. We’ve been here 125 years. Orchid collecting has been going on for longer than that. So we owe this to the passion of those people. It’s an homage to those guys and ladies and people who sometimes gave up their lives so that we can enjoy these plants. And we also give them a nod because in terms of breeding and conservation, we’ve come a long way. We’re much more responsible, hopefully, nowadays in regard to collecting. Not always, but we’re trying. Of course, the mission of the garden is to move that along and to show the public these plants that they wouldn’t have access to see 125 years ago. Orchid collections was only accomplished with those who had the wealth to fund orchid expeditions for themselves or orchid collectors. This is the centerpiece of the collection. (Christian points to the magic mountain of orchids towering above us.) When the Victorians obtained these beautiful plants, they would bring them into their greenhouses and try to stage them basically to reproduce nature. We found this incredible drawing. I think you all have access to it. It’s an 1837 sketch of the Epiphyte house at Knypersley Hall. (The illustration appears in a two volume tome commissioned by James Bateman, The Orchidaceae of Mexico and Guatemala, 1843). It’s about a 5-6 foot mountain they built at the center of the greenhouse, beautifully covered with ferns and orchids. I thought, wouldn’t it be great to take this and put it on steroids? So I asked, “Hey, can you build me a fake mountain? And they came back and said, ‘No, that would cost as much as a vacation home in the Hamptons. But what you can have is a bunch of four foot by four foot cubes.’ So the bones of this mountain are four by four steel cubes stacked on top of each other. It looked great on paper. But when I saw them stacked I wondered, how are we ever going to make that look like a mountain? Hours later and many rolls of chicken wire later, we were able to mount it and plant it to look much like the mountain in the picture but just on a grander scale. It’s hollow and we have a little access door. I won’t tell you where it is. So it’s on the mountain and we can go inside and water it from the inside. All the orchids are wrapped by hand in moss so we can actually water them from the inside through the chicken wire. It looks like a beast to water but it’s fairly simple to do. It’s an homage to those guys who really were so passionate and built these structures. It is naturalistic but that’s what they were going for and it is the inspiration for our centerpiece mountain. I really let my staff loose in terms of creativity. I cannot thank them enough because I really worked them to the bone. So as you walk around, you are going to see lots of little moments and vignettes so the character of each one of my staff members is actually reflected in certain moments in the display. I hope that people will find the moments that appeal to them whether it be the really intense colors or delicate colors or the moss areas or the small areas of the Paphiopedilum, the Lady Slipper orchids, to find something they can grab onto. My hope is that the orchid enthusiasts will be as psyched about the show as the people who are general plant growers. They’ll find something they can recognize or something that will spark that passion that we all have here. I mean that’s what it’s all about. We want to share what we love and ignite this love in them as well. I planned for a large waterfall in the front, and in the back something a little more peaceful. So we just wanted to have a mossy grotto of water, taller in the back and a bit crazier in the front. In the sketch there’s actually a bird’s nest fern at the top of the mountain. I thought it would be great to take a little license. So we took bromeliads up there and again on paper it looked great. But when we actually had to climb up the mountain carrying a 70 pound bromeliad, it became less fun but we got them up there and we got everything planted. And are fairly happy with the way things turned out. So that’s it. So this was based on that illustration that we talked about. And then we head into what I imagine Marc Hachadourian’s greenhouse looks like. For the crazy plant nerd, orchid geek, this would be the greenhouse that you see. And again we took license and as I said we’ve come a long way in terms of breeding and cultivars. What you see here crazy color, lots of contrast, lots of strange plants and again a huge, huge variety of orchids that we have in this section. 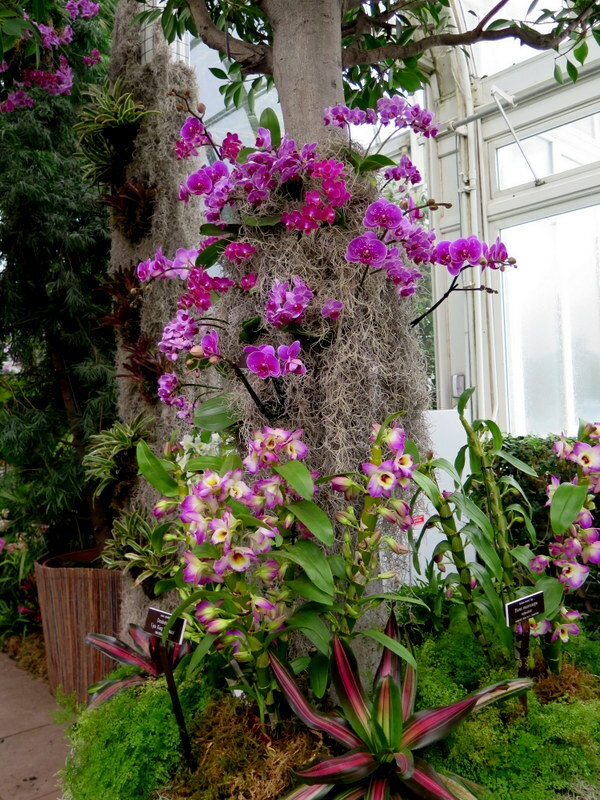 Orchids are epiphytic and grow on trees and rocks. Others are terrestrial orchids, depending on where they grow. Lots of plants will be epiphytic. Note the walls. They are reproductions of the walls that are actually in that scene from Knypersly, so we had those reproduced. A working greenhouse would be dingier and a little less densely planted. We have the potting benches where people can learn a little about propagating orchids and what a working greenhouse would be like but this section of the display it’s predominately ornamental. We tried to load it up with a diverse selection of orchids. The Phalaenopsis (moth orchid) on the mountain everyone is familiar with but you come in here and even if you’re a serious orchid aficionado, you will see a lot of interesting orchids you may not have seen otherwise. 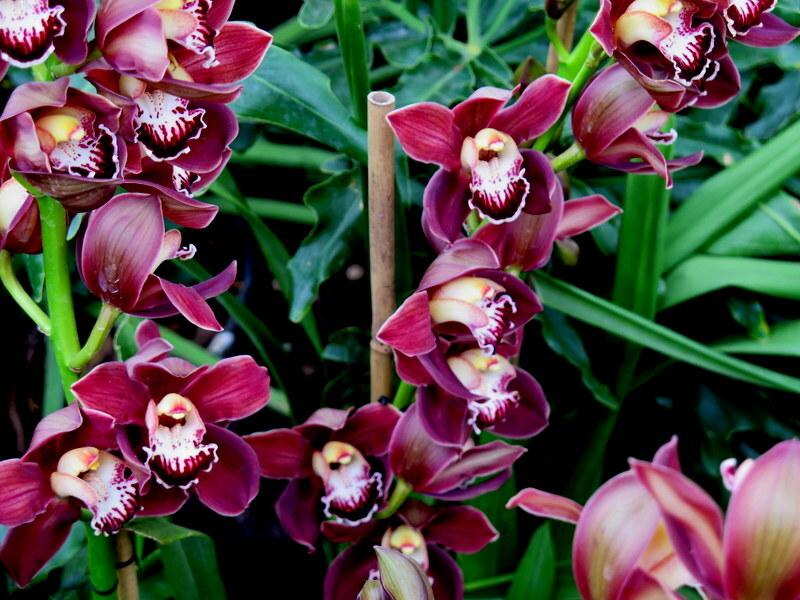 The more expensive orchids come from our permanent collection. Explorers and others used the Wardian Cases to transport orchids back in the Victorian era. They created and maintained that micro-climate to keep them alive. The show also highlights the history of Ward and the invention of the Wardian case wonderfully. The Wardian Case is a symbol of the Victorians. 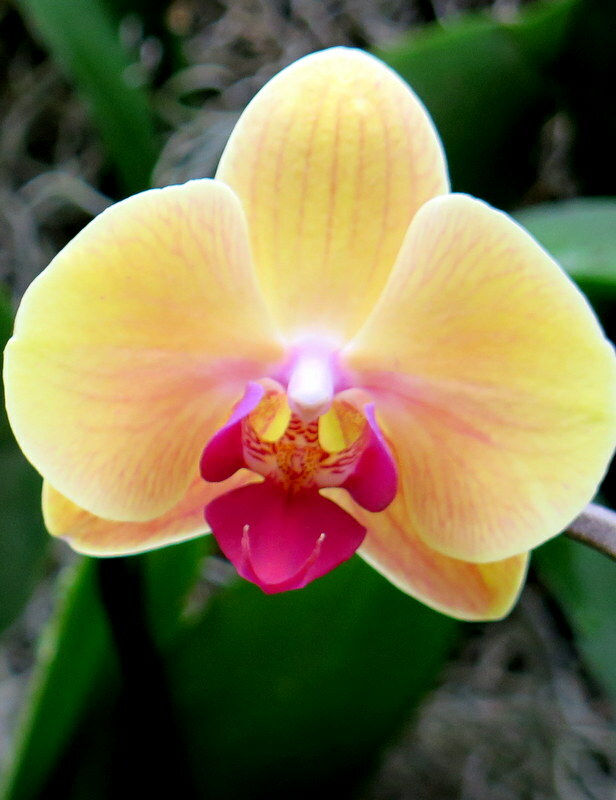 The majority of the orchids that people buy are from Florida, Hawaii, California. The bulk orchids come in from nurseries around the country. And the rarer ones come from our collection. (What happens to the orchids after the show?) We all have plenty of orchids in our houses after the show. But we donate the rest to schools and societies and give them to people who use them to teach so they don’t go to waste. If they are degraded then we compost them. They have their own value and come back into the greenhouse or into the vegetable garden as they are recycled. So that’s what we tried to do with the show. It turned out to be more ambitious than we thought in terms of numbers of orchids, but I’m happy it doesn’t look like Q*bert the game. That’s what it looked like before we planted. I think we succeeded. We took Q*bert out of it, making it look natural. Orchidelirium, The NYBG Orchid Show 2016, concludes April 17th. Check the Garden website for details about Orchid Evenings on Saturdays (March 12, 19, 26, April 2, 9, 16), as well as Friday (April 15), and Thursday (March 24, LGBT night). On select evenings visitors can also upgrade to V.I.P. status and enjoy the Orchid Lounge. Are you a fan of orchids? Do you properly care for them? Or do you end up having to throw them away? When orchids were first discovered, people were devastated when they killed them because other orchid plants were not easily accessible. in the 1900s orchids were a rare flower commodity until things began to change and they grew in popularity as they became known. Orchidelirium was the title given to the Victorian era of orchid flower madness when collecting and discovering these exotic and beautiful plants was the intention of wealthy merchants and fanatical collectors. Motivated by the flower frenzy, they hired explorers to uncover different, unknown species from far flung reaches of the world oftentimes at great danger to themselves. The obsession with orchids never really died down if one reads Susan Orlean’s The Orchid Thief, a humorous tome about orchid collecting and the lengths to which those in the business go to indulge their passion for orchids, even theft. For orchid passionistas, the NYBG has an extensive collection of exotic and rare orchids, some that don’t even look like orchids, yet, they do belong to the same plant family. Because of the ever popular annual orchid show in February of each year, it was no large leap to understand how NYBG orchid curators and exhibit programmers might have gained inspiration from the frenetic orchid craze of the Victorian era to revisit that time and spur on fans’ curiosity and love of the exotic blooms, by referencing the Victorians’ fervent obsession. Orchidelirium the NYBG 14th annual orchid show which opens on February 27th and ends on April 17th, promises to inform, dazzle and celebrate the century-old appreciation of what Mark Hachadourian, NYBG Director of the Nolen Greenhouses and Rock Garden for Living Collections-and an orchid fancier, has characterized as the largest and most environmentally adaptive plant family in the world. Pansy orchids from previous NYBG orchid shows. Visitors to the landmark Enid A. Haupt Conservatory will step back into the time when orchids were a rarity to confound and mesmerize. Wealthy Victorians were surprised that some of the lavish blooms had no fragrance while others did. Nevertheless, they were enchanted with the orchid’s symmetry and pixie tongued faerie face that elevated the flower to a symbol of power, opulence and luxury in England. The indulgent fascination with the vast varieties of blooms of a continuum of shapes, sizes and textures will thread the exhibit and highlight how these amazing flowering plants were transitioned from the wilds of jungles and deserts to indoor cultivation in conservatories and glasshouses, and eventual commercialization when the price could be stabilized and lowered for the middle classes. NYBG orchids from previous years at the Orchid Show. 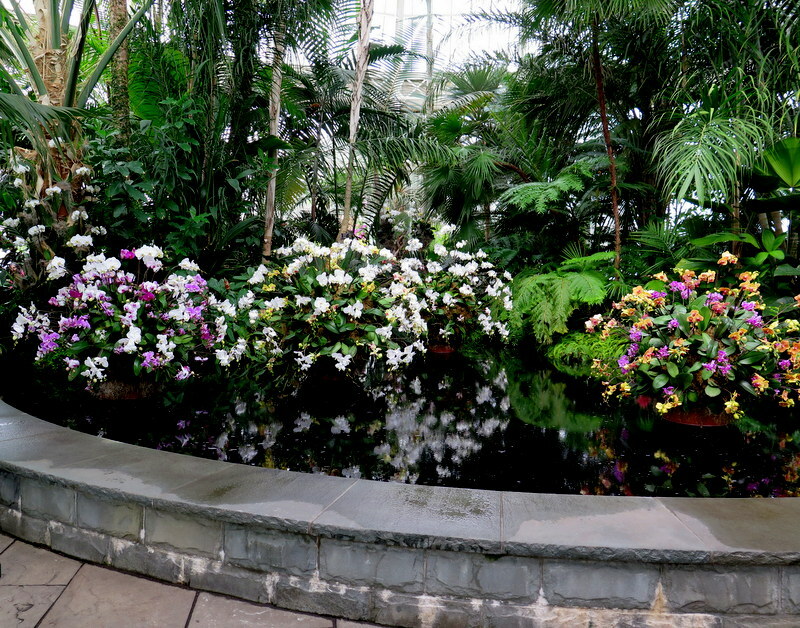 The NYBG’s substantial and elegant permanent collection represents all the floristic regions of the world. These include Australia, Africa, South America, and Madagascar. The exhibition will showcase some unusual and rarely seen jewels in the NYBG orchid crown. One such specimen is the spectacular Psychopsis papilio which inspired the Duke of Devonshire’s obsession that instigated Orchidelirium in London. Another inspiration which will be displayed is Paphiopedilum sanderianum which was named for the nurseryman Frederick Sander, the self proclaimed “Orchid King,” a plant which is renowned for its petals’ remarkable length. Orchidelirium at the NYBG Orchid Show 2016, evoking the Victorian era scenes with orchid blooms. 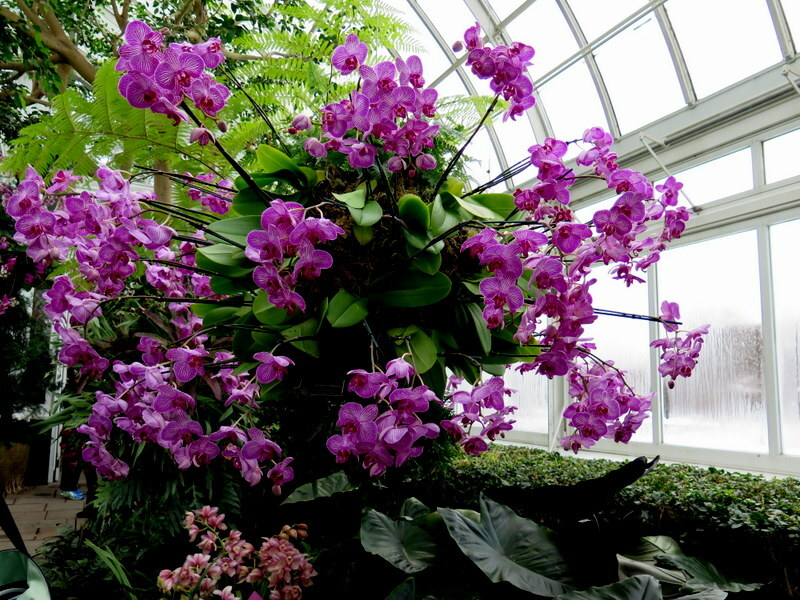 Moving on through the Conservatory galleries, visitors will learn about the transition of orchid growing. The trendsetting Duke of Devonshire began collecting orchids in 1833 at his Chatsworth House estate (still there today). His head gardener, Joseph Paxton, revolutionized the way orchids were cultivated in England by innovating larger and more effective glasshouses, beginning with the Great Conservatory in London and culminating in his masterpiece, the Crystal Palace of Prince Albert’s Great Exhibition in London in 1851. A series of orchid vignettes will recapture the brilliant glasshouse displays that the Duke and other collectors tirelessly effected with their newly acquired delicate specimens brought back by explorers, hunters and adventurers with whom they fiercely competed for various plants and endured all manner of thrills facing animals, reptiles, humans who would readily pounce on them for disturbing their territory. 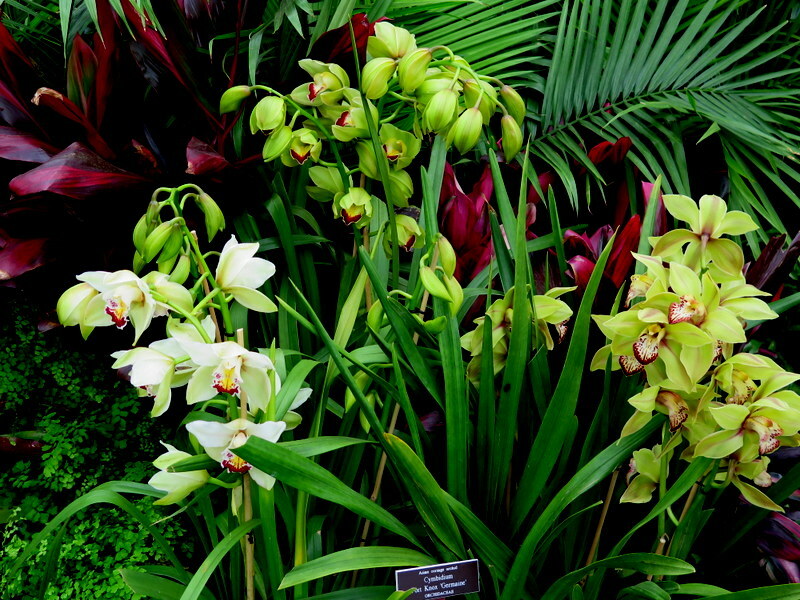 Orchid varieties number into the thousands. Some of these will be represented at the NYBG Orchid Show 2016. 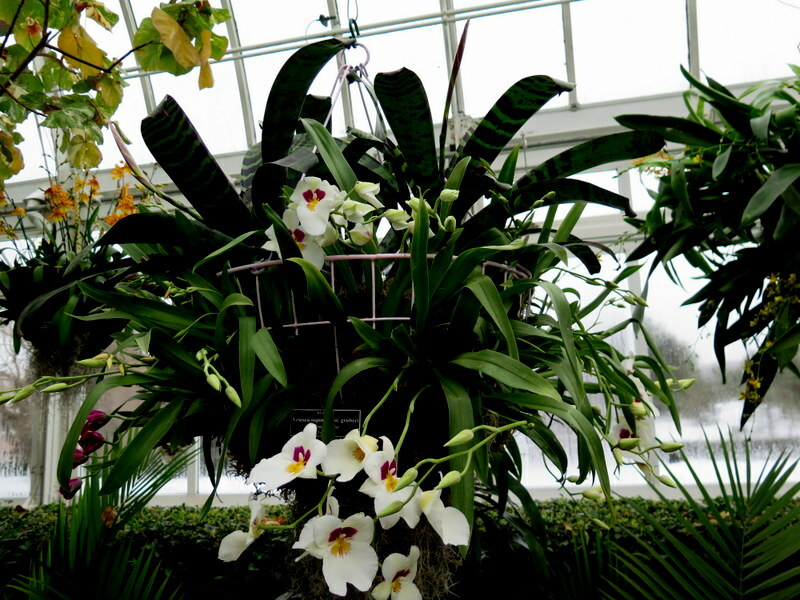 From antique to modern, the orchids are in stand alones amongst the glasshouse greenery, as well as in hanging baskets, hanging pots, Victorian wall displays and elsewhere, in fact, wherever you turn. 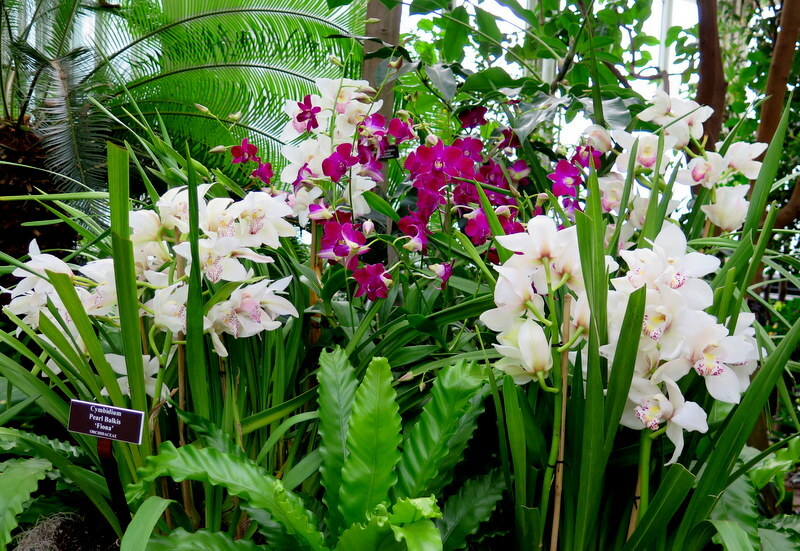 Each area of the conservatory will contain a diverse selection of orchids from around the world. Formal arrangements will be intermingled with casual plantings however, in typical NYBG fashion. And you can expect that all will be made exuberantly gorgeous and lush with a riot of blooms assaulting the intellect and immersing one in a sensory playland. A small stone patio will accommodate a stunning Wardian Case (an early type of protective terrarium for plants), housing a selection of miniatures. Kudos go to designer Christian Primeau who oversees the extensive tropical/subtropical plant collections housed in 11 unique environments in the Conservatory. Marc Hachadourian curates the exhibit’s orchid selection and the NYBG’s extensive groupings of living plants from around the world housed in the Nolen Greenhouses, the behind-the-scenesglasshouses where plants for the Garden’s indoor and outdoor and science program are grown and maintained. 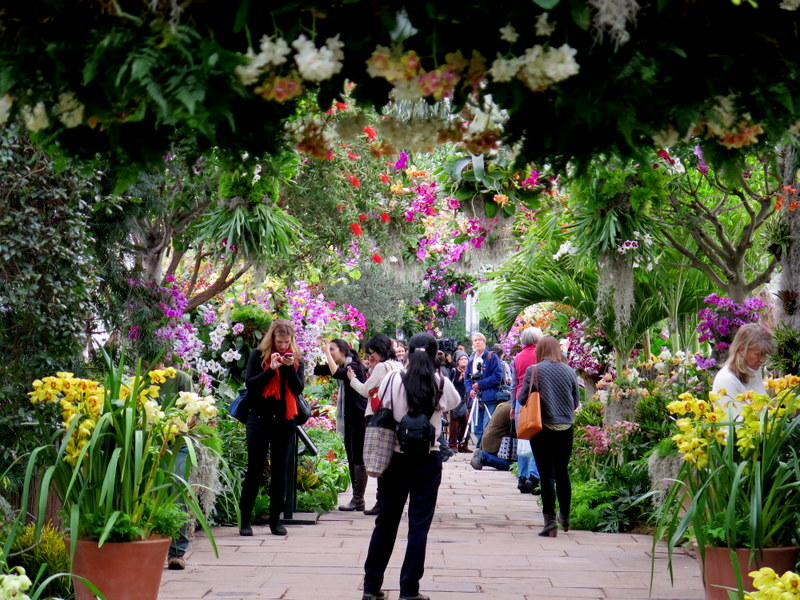 The 14th annual orchid show ORCHIDELIRIUM promises to be an enlightening and enjoyable way to usher in springtime at the NYBG. The show begins on February 27th and ends April 17th. You can learn more at the NYBG website by clicking HERE. Photos and copy details courtesy of the NYBG. 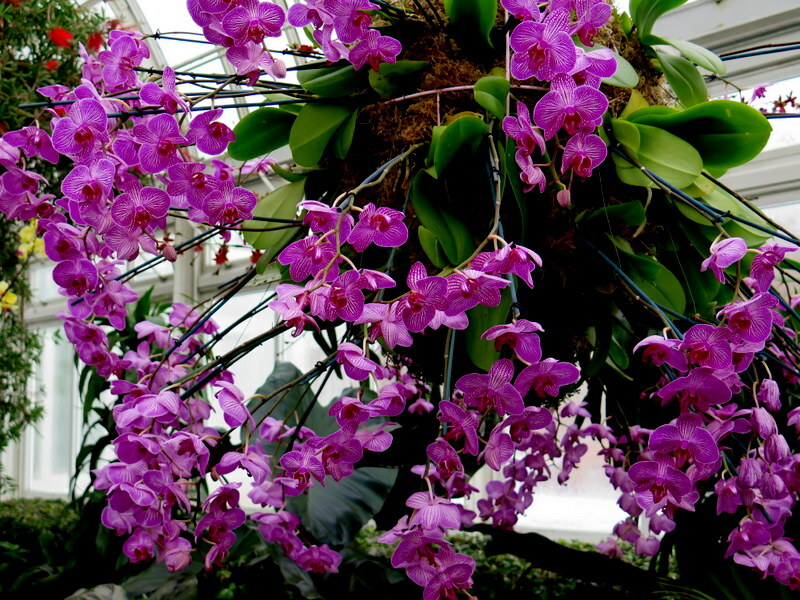 The 13th Annual Orchid Show: Chandeliers is currently running until April 19th at the New York Botanical Garden. The show is amazingly beautiful and a much-needed encouragement during what sometimes seems like an eternity of winter. During my wondrous visit relaxing amongst the gorgeous blooms, I spoke to Marc Hachadourian, Director of the Nolen Greenhouses for Living Collections. Marc is a fount of information about the orchids. His title belies his down-to-earth nature and sunny personality. I can understand his joy working around such vibrant, luxurious plant life. A fellow photographer kept on remarking during our visit that the Garden is a great place to decompress and rewind from frenetic city life. It’s another world at the Enid A. Haupt Conservatory, and Marc’s job is to make sure that all the orchids in the Garden’s permanent collection are as happy with their living conditions as possible. He is also responsible for curating the hybrids brought in and grown for the Orchid Show. Marc Hachadourian, you’re the resident orchid expert here supervising the care of the botanical collections including the extensive orchid collection and exhibition plants in the Nolen Greenhouses. Yes. I’m the curator of orchids at the NYBG. I know you love orchids from what you told me when I spoke with you last year. Orchids festoon your home where you have a great variety and number of orchids. And you are probably way more successful at keeping and caring for orchids than I am. OK. How old is your oldest orchid? At the Garden or my personal collection? Some of them aren’t. They range in age in our collection. But some of our oldest orchids in our permanent collection…are not on display because they are not flowering at this time of year, but we actually have plants in our botanical collections here at the Garden that are over 100 years old. People assume that a 100-year-old orchid must be the size of a house, but in reality, some of the plants may be miniature, so you may be able to hold a 100 years of orchid growth in your hands. So it’s something that we have a long historic orchid collection here at the NYBG. 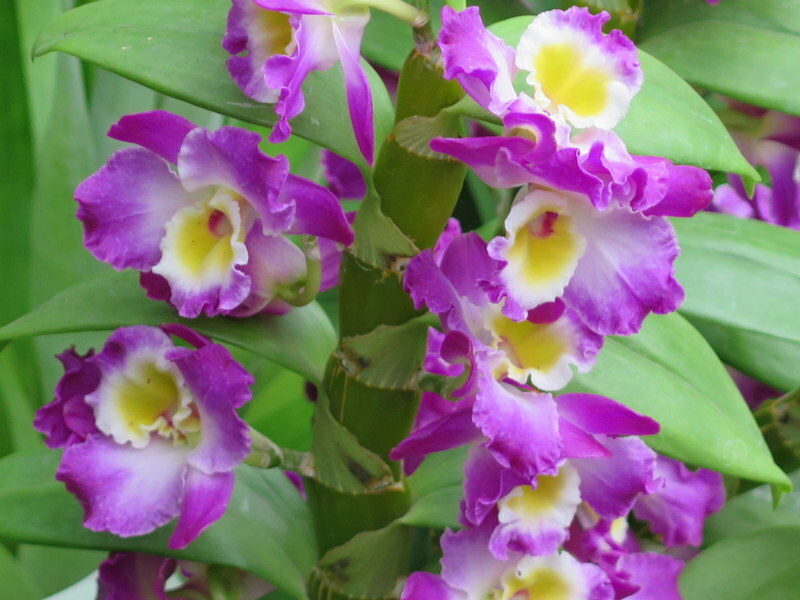 In fact we have one of the best orchid collections of any institution. There are about 7,000 specimens in our permanent orchid collection. We have all different sizes and different types. You had mentioned the miniature orchid which we have on display in the conservatory where we pull out a lot of the really interesting and unusual botanical plants from our collection, plants that you might walk by if they were put next to some of these really flashy hybrids. 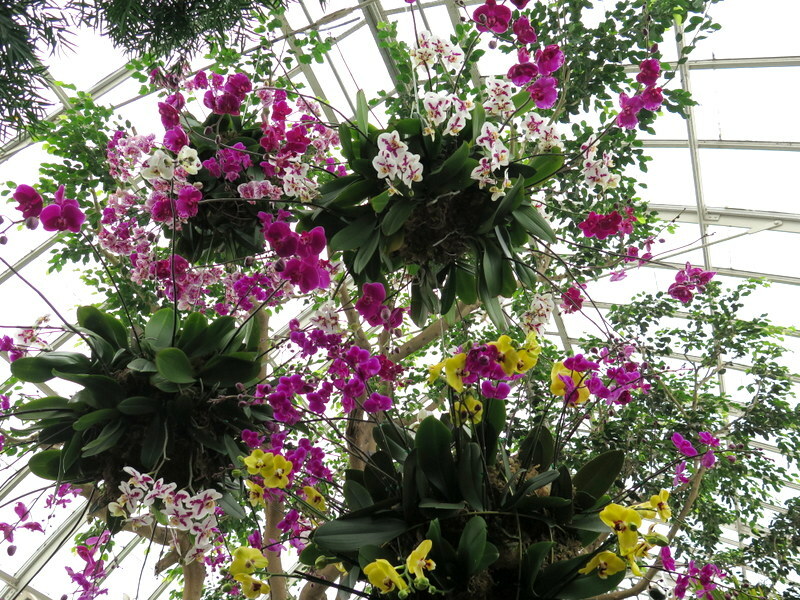 Orchids are the largest flowering plant family and they vary size from the head of a pin to 25 feet tall. 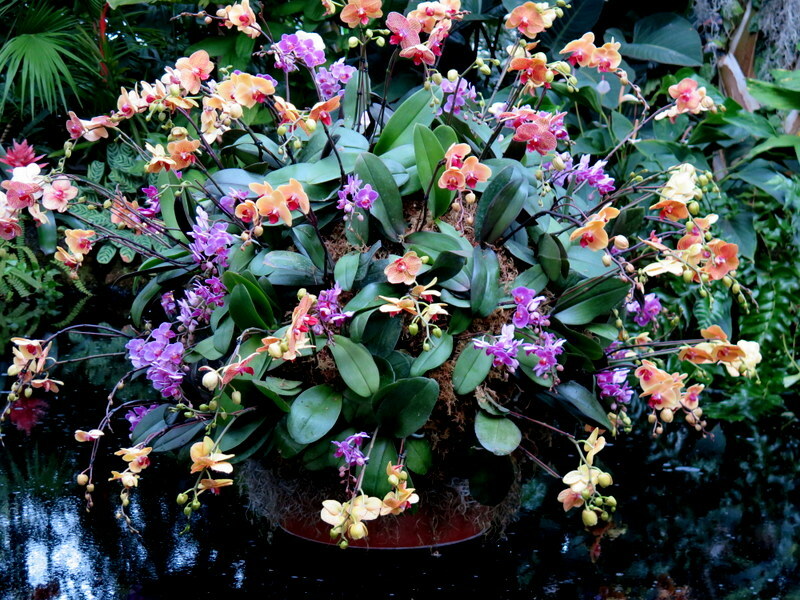 Photo by Carole Di Tosti, The Orchid Show at NYBG. But in reality there are some orchids in the glass case right now that in the palm of your hand in that miniature plant you can hold anywhere from 700 to 1,000 individual blooms on a single plant. Of course, the flowers are so tiny, they are no bigger than the head of a pin, but it is wonderful to hold a plant with that many beautiful flowers. They are from a range of geographic habitats, everywhere from Australia, Southeast Asia, South America, and a range of sizes [1/16 of an inch in diameter to giants more than 25 feet tall], colors, shapes. It’s one of the things that surprises people when they come to the Orchid Show. It’s not just the beauty of our displays, but the extreme diversity within one plant family, the orchid family. These very rare miniatures – were they sent? No these are part of our permanent collection that we grow in the back of the greenhouses and that we bring out when they flower. Do you grow them by seed? We grow them by division mostly. Sometimes, they will be sourced by specialist orchid nurseries and because we have not only a display collection but a noted research collection, one of my important jobs as the curator of the orchid collection is making sure that we have the proper diversity and a proper survey of the orchid family represented in our botanical collections, so researchers all over the world can come here and use our collections. It is much like a living library of plants. So if you want to think of it as a library collection or an art collection, that fits. If you specialize in Impressionism, you want to make sure you have a few Monets and a few of this and a few of that. It’s the same thing with developing an institutional orchid collection. You want to make sure you have representative display, not only orchids from each country, but from each type of orchid that grows around the world. So we have one of the largest and one of the most widely represented orchid collections of any institution in the world. The orchid family is the largest flowering plant family. There are over 30,000 naturally occurring species and now over 150,000 man-made hybrids. They’re found on every continent of the world except Antarctica and everywhere from deserts to swamps to tropical rain forests, even up to the Arctic tundra. So even places that you don’t usually associate with orchids normally have orchids. When you think of this family, you think of the tropics, the rainforest, but there are orchids native to Alaska. And there are even orchids growing within Manhattan itself. There are native species. I don’t know if there are any Lady Slippers still growing in Manhattan, but there are Lady Slipper species growing throughout New York State. Many of these native species, which are protected by law, can still be found, although rarely in the Tri-State area [New York, New Jersey, and Connecticut]. So these are a few details that you wouldn’t normally think about orchids. Are there species that you think are still undiscovered or that you are trying to get a hold of that are very rare? to our collection. Just like there are very few Vermeers in our world and everybody would like to have one as a part of their art collection, these rare plants are a bit more challenging to come by. 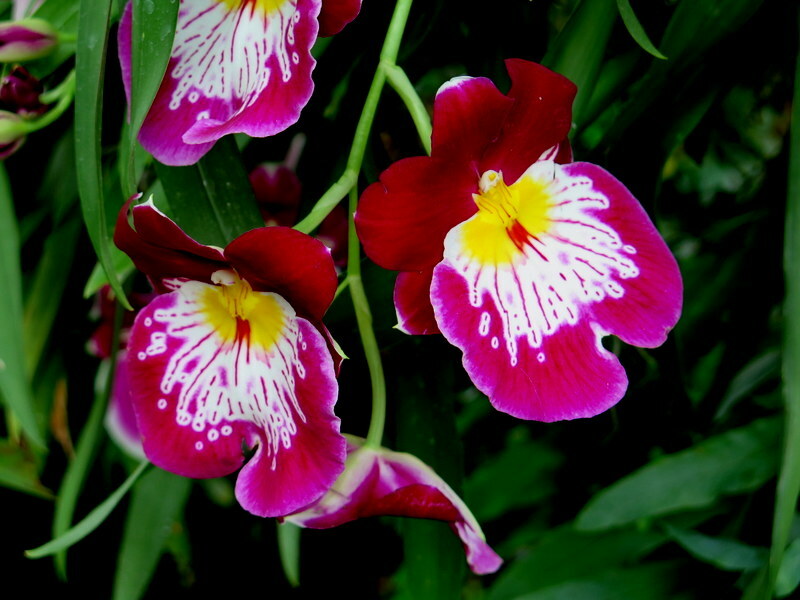 But in our orchid collection, there are orchid species that are discovered every year. Dozens of species are newly described. People might go into an area they’ve never been before and find something new. Sometimes they are right under your nose. There are areas that are well traveled that have orchids. But you would have to have been there at exactly the right moment to see the orchid flower. So it’s fascinating that every year there are so many new species described and discovered. Some of these orchids, the rare ones, must be extremely valuable. The value on some of these orchids to the obsessive collector wanting the rarest of the rare, the most unusual plant can create an exaggerated pricing. Like the tulips? [we both laugh]. Yeah, almost like the tulip mania of the 15-16th centuries. But the value we place on our plants is not something financial. It’s conservation value, biological diversity value. For some of these plants it may be that they have a wonderful history or the orchid may be a rare hybrid. So for that, their value would be almost priceless for what they represent in the orchid family. The loss of one? I know how I feel if I lose an orchid or one of my plants; I’m devastated. Well, I’m sad. If it’s something beyond your control then you do get sad at those moments. But there are more successes than failures, so that makes up for it. You must have read Susan Orlean’s book, The Orchid Thief? Thanks so much for speaking to me. You are so knowledgeable, I enjoyed talking with you. Oh, one more question. You were going to check on how many orchids comprise the Orchid Show. One might die at any moment. We are replacing plants throughout the show so the exact number is always changing. We know that at any one time there are thousands. Having anyone actually count them…? No – it would be a dizzying effort. 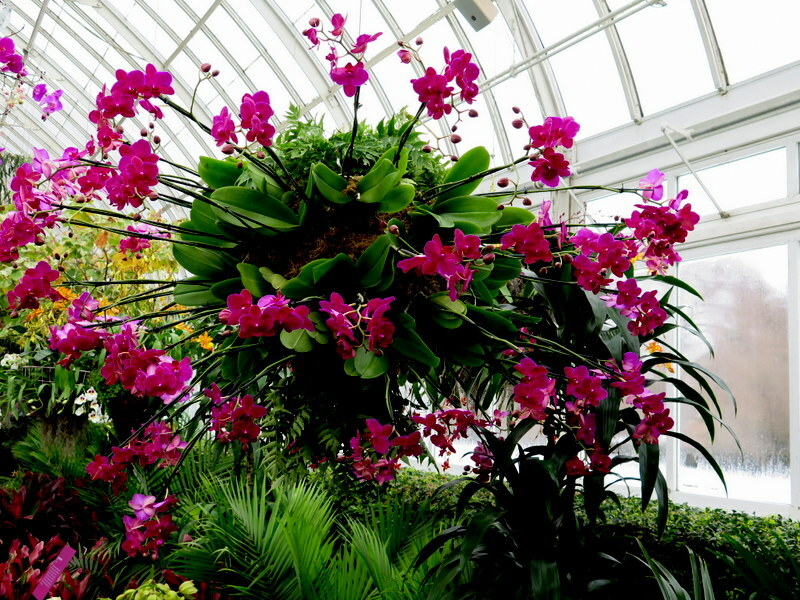 The 13th Annual NYBG Orchid Show: Chandeliers is being exhibited now until April 19th, 2015. Click here for tickets. March 5th, a plane at LaGuardia skidded off the icy, snowy runway. A wet, unwelcome, sterile, white dirge blanketed the area. Who knows how many more intermittent days of abysmal cold, sleet, snow, and ice will oppress? Though there seems no end to this weariness, there is a herald of spring at the New York Botanical Gardens. It is the 13th Annual Orchid Show. 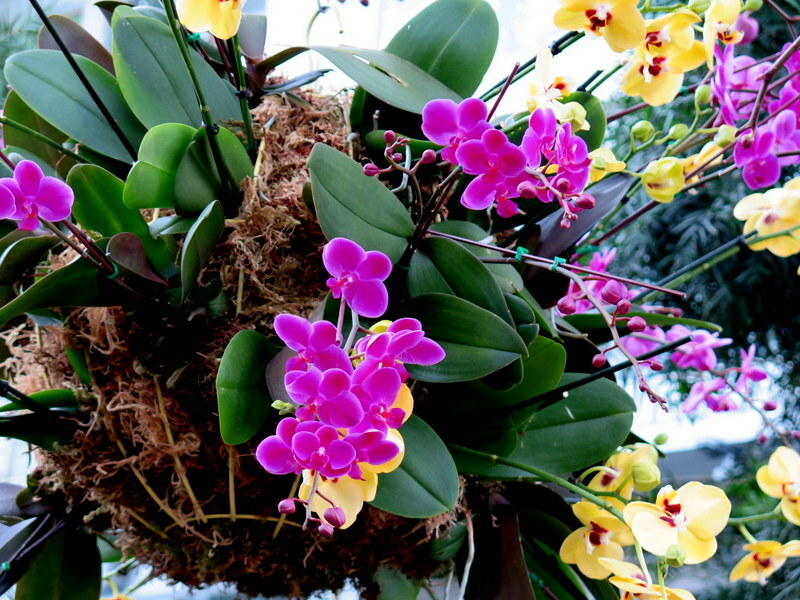 A renaissance of beauty and hope hangs high in the orchid baskets’ blazing, airy, living, colorful auras. These amazing and most popular of flowering plants shine their blossoms and illuminate their colors upward toward the palatial ceiling of the Enid A. Haupt Conservatory. How welcome to me are these stunning, brilliantly conceived and executed flowery clusters. They are truly a spiritual and emotional uplift to take me to the end of the long, blistering winter to sing in the sweetness of springtime. 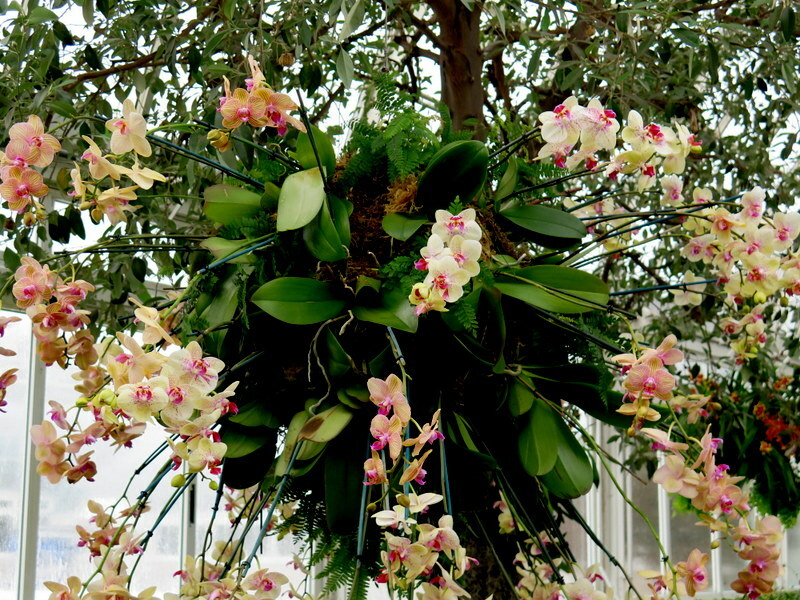 The theme of the show this year couldn’t be more appropriate or illuminating; it is “Chandeliers.” Everywhere you saunter through the delicate looking Victorian-style glasshouse, you see the mysterious, sensual, ripe, and fecund vividness of arcing orchids curving out like delicate feathers. There are thousands of them. Pools of water reflect their petals in a kaleidoscope of pastels, tints, shades, and darkest hues. 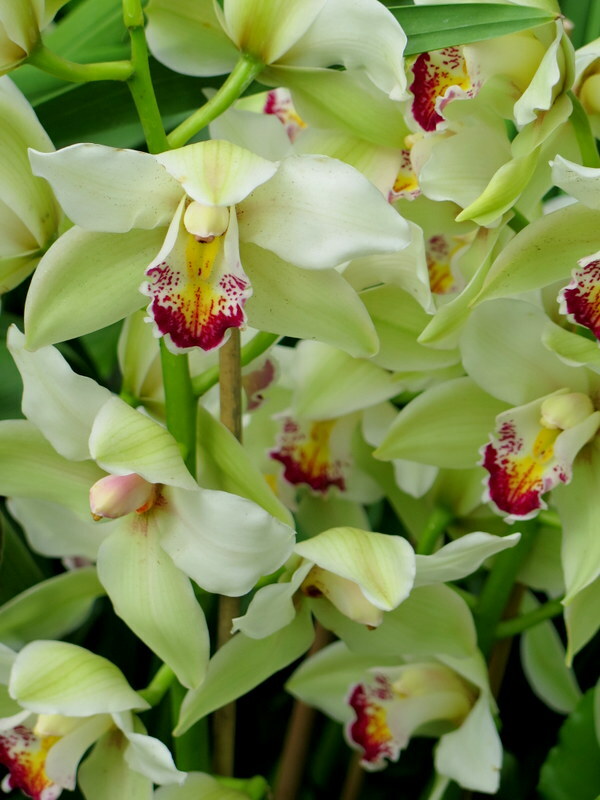 Not only are the Cymbidium and Cycnoches landscaped exquisitely amongst the flora of the greens, reds, yellows of the ferns, palms, dracenas, and other botanical varieties that flourish in abundance in the warmth and moisture of the conservatory. But the adder-tongued (Theodore Roethke’s description), blooming plants are the stellar creations, the showpieces above the pathways in pendant, lustrous, rainbow baskets. Their powerful, subtle beauty is the growing candelabra that lights the way. The orchid chandeliers are a vibrant multi-layered overflow of pinks, violets, whites, tawny oranges, yellows, purples, reds. It is enough to mesmerize and gladden the most sorrowful and dour of hearts. Look up, twirl around, everywhere are Cattleyas and Phalaenopsis of a multitude of varieties and a range of colors that poor crayola only wishes they could duplicate. But as in other past orchid shows, the amazing history and conservation stories of rare and endangered orchids in the rain forests of the world are included and can be read on the cards throughout the exhibit or listened to on one’s mobile phone. Throughout the Garden’s 250 acres in its various venues, The Orchid Show: Chandeliers allows guests the opportunity to learn about the largest family of flowering plants through tours, orchid care demonstrations, and discussions about how the elegant flower chandeliers were made. The snow is still falling into the evening. I didn’t buy any orchids when I visited the beloved NYBG shop because I was afraid they would get a chill and “catch their deaths.” It was below freezing and the wind crinkled my face walking to the Enid A Haupt Conservatory. However, the moment the light brightens, the sun is higher overhead and it’s closer to spring, I will return to buy a piquant, fuschia pansy orchid if there are any left. Or I might go for a glass of wine during one of the Orchid Evenings and stop at the shop on my way out. I’ll check to see if there’s an unusual Cattleya for sale. After all, the show runs until April 19, 2015. By then Spring will have adorned us with her presence and my newly bought orchids will remain out of reach of cold cruelty as winter marches toward Peru. 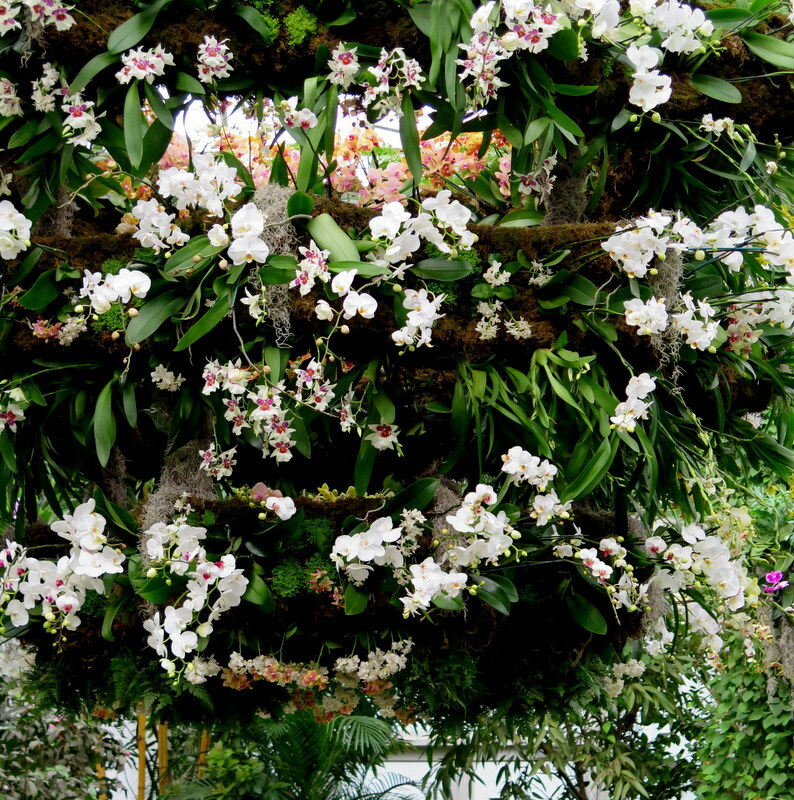 The 13th Annual Orchid Show (Chandeliers) is at The New York Botanical Gardens until April 19, 2015. Click here for tickets. This feature article first appeared on Blogcritics. Click here.